If you're looking to go off the beaten track, few places can match the allure of the ancient capital of the Eskimos, Shamanic pyramids or the Chechen "City of the Dead". The absolute lack of transport and infrastructure does not put off travelers who have made up their minds to see these forgotten corners of Russia. It is very difficult to actually get to these areas, but RIR will guide travelers to 12 unique places not many people know about and only a few eyes have seen. Taimenye Lake is situated at an altitude of 995 miles, but the waters still warm up in the summer – up to 80 degrees Fahrenheit. Frequent, strong disturbances cause layers of water to mix right down to the bottom, producing limited visibility in the water. The water in Taimenye Lake, whose basin was formed by the movement of an ancient glacier, has a bright turquoise gleam. The lake is 3.4 miles long and surrounded by more than 250 small lakes. Since 1991, Taimenye Lake has been part of the Katun biosphere nature preserve and 15 types of plants listed in the Red Book grow in the vicinity. Where: In the Altai Mountains – the nearest populated area is Multa village. Travelers can get to Taymenye Lake from the lower Multa Lake. Follow the byway for 3–4 days on horseback, and then go on foot for 2–3 days through the passes. The Uzon volcano is situated in the Kronotsky nature preserve, to the south of the lake of the same name. This district produces the youngest oil on the planet. One of the biggest calderas in Kamchatka – 1 mile in diameter and home to Lake Dalny – is located in the eastern region of the volcano’s 93-square-mile crater. On the plateau surrounding the volcano, hundreds of columns of steam shoot out of the yellow fields, which alternate with green thickets and sunburnt tundra. The crater’s western region contains nearly 600 springs and a diverse array of colorful flora and fauna. Numerous algae and bacteria that live quite comfortably in the boiling toxic emulsions are of special interest to scientists. Where: In the south of the Kronotsky state biosphere nature preserve, Kamchatka peninsula. Travelers can only access the volcano by helicopter: the flight from the nearest airport, Yelizovo, takes about one and a half hours. A taiga lake of just over 12 square miles of unparalleled beauty is what remains of a prehistoric sea located in the Komi Republic. At the beginning of the 20th century, numerous dwellings of primitive men were found on the shores here. Sometime later, corrective labor establishment M-222, which shut down only quite recently, was built here. Not far from here, according to numerous folklore sources, the cultural hero of the Komi, Yirkapa, died after a hunt. Where: Knyazhpogostsky district, Komi Republic. Ride the Moscow–Vorkuta train as far as Sindor station, then take the rail car on the Sindor narrow gauge line to the tourist camp at M-222, about 2 miles from the lake. The entire narrow gauge railway workforce is comprised of prisoners, as the line was built for the needs of the corrective labor camp. The line remains under the jurisdiction of the Federal Penitentiary Service. The cape at the confluence of the River Argun and the smaller mountain river Mechi-Khi is surrounded on three sides by icy waters and linked to the rocky ridge by a narrow isthmus. Tsoy-pede, the Chechen City of the Dead, is essentially an inaccessible crypt. The earliest of the 42 burial vaults dates back to the 14th century. According to popular accounts, it was founded in the midst of a devastating epidemic: sick people themselves came here to die, since there was no one and no time to bury the dead. Those who come to Tsoy-pede today are met by pagan altar columns, protective crosses and solar spirals on the walls, and the depiction of a human figure that can still be made out on the guard tower. It is believed that this human figure is supposed to be the Christian Saint George. The Orthodox state of Georgia is very close to Tsoy-pede, and the proximity of this border explains the need to obtain permission from the FSB to visit the City of the Dead. Where: Itum-Kalinsky district, Republic of Chechnya. Travel from Grozny to the district center Itum-Kali by minibus taxi, then hitch a ride and walk the remainder of the way. Permission from the FSB is required to enter the border zone. The youngest waterfall known to science – the Uchar on the Chulcha River – was only discovered at the end of the 1970s. It is the product of a powerful earthquake that shook the area around 200 years ago. The path to Uchar lies above a cliff and crosses numerous mountain streams, which should not be crossed by those unaccompanied by an instructor. Tourists who find themselves in this part of the Altai must not forget about the Mongolian Five-Toed Jerboa. When provisions and personal items go missing, these rodent creatures are usually to blame. Something between a squirrel and other four-toed jerboas, the Monogolian Jerboa has no fear of man and is will venture very close to travelers. Where: Ulagansky district, Altai Republic. Travel by car from Biysk to the settlement of Artybash (the road ends several miles ahead of the destination), then take the launch on Lake Teletskoye. Travelers can also depart from Gornoaltaysk: hitch a ride to the main farmstead of the Altai nature preserve in the settlement of Yaylyu, then continue on foot (a guide is necessary). 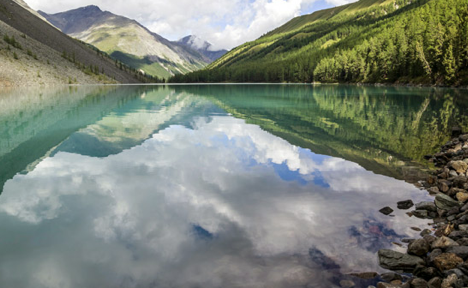 Permission is required to visit the Altai nature preserve. A secluded church in a log enclosure with numerous towers stands in the center of a field, with only Karelian boulders and lakes surrounding it. Like most ancient Christian structures, the hermitage, built in the 1780s, essentially took the place of a pagan shrine – its main chapel and three surrounding churches from the same period lie on a geometrically straight line, running south to north. According to many ancient communities, one of the towers of Porzhensky Pogost contains the so-called “Aleph” from Borges’ story of the same name. The Aleph is described as the keyhole of the world – the place where all points in the universe coincide. Where: Kargopolsky district, Arkhangelsk Region. Ride the Moscow–Arkhangelsk train (it departs from Yaroslavsky Rail Terminal) as far as Nyandoma station, then take the bus to Kargopol, and another bus from Kargopol to Maselga village. Go the last 10 miles on foot. Unezhma, which was founded at the beginning of the 16th century, was once one of the main stations on the Pomor post route. At the time, there were 80 households in the village and a population of 500. The original inhabitants – the Pomors – were primarily involved in fishing, seal-hunting and salt extraction. There are still neglected “usolya” (places where salt was evaporated from water) on the outskirts of Unezhma. In the post-war years at the end of the 1940s, the village began to shrink: only 12 people still lived there, and the only landline telephone in the whole village stopped working when its owner died. After this, the bronze telephone wires laid before the war were sold for scrap. The last female resident in Unezhma, Olga Kukoleva (born in 1914) died one year ago. The village is now only visited in summer by a few descendants of its residents. Travelers who are interested in the village’s mysterious cemetery and the remains of ancient, lopsided, wooden huts also visit. Where: Twelve miles from Unezhma railway station, on Cape Brannits of the White Sea. Travel by train from Murmansk or Arkhangelsk to Unezhma station, and then go by foot. Alternatively, travel by sea from the neighboring village of Nyukhchi or Maloshuiki, if anyone local is willing to take travelers by boat. The Naukan settlement was founded sometime in the 14th century. Prior to the expulsions, nearly 400 people lived in Naukan and separated into 13 clans. The resettlement forever scattered those who spoke the Naukan dialect of the Eskimo language. Some of the Naukan were settled with the Chukchi people, while others were moved into places where other Eskimo dialects were spoken. The permafrost, which happens to push foreign bodies to the surface, allowed for the discovery of the paleo-Asiatic cultures that replaced each other in this region for three millennia. Today, the only reminders of the capital of the last of these cultures – the Eskimo – are whale bones jutting out of the coastal grass and numerous bone artifacts of unknown age and purpose. Where: Cape Dezhnev, Chukotka Peninsula. Take the Moscow–Anadyr flight, travel to Lavrenty village on a regular flight with Chukotavia, and then fly on to Uelen settlement (flights depend on the weather). Travelers can also take the ferry that operates on the Bering Strait, June through August. The monastery is 68 miles from Nimenga station. Travelers are often given lifts to the start of the forest track by lumber truck drivers, if they happen to meet one – but there are still nearly 20 more miles to walk. Even after this, travelers must make a fire on the lake shore and wait until someone notices it on the other side and sends a boat over from the monastery. Besides roads, the monastery still lacks electricity and telecommunications. Nevertheless, every year the monastery welcomes dozens of pilgrims, many of whom stay here for the rest of their life. The head of the Kozheozersky monastery, Father Mikhei (Micah), was born in Sergiyev Posad. He is a conductor by trade. He graduated from the Moscow Sveshnikov State Choir School and sang in the Holy Synod choir that was created under the Moscow Patriarchate in 1986. Where: Kozhozero, Onezhsky district, Arkhangelsk Region. Travel by train from Onega to Nimenga station, hitch a ride to the start of the forest track, and walk down the track for about 20 miles to reach Kozhozero. Cape Ryty (meaning “dug up”) did not get its name by accident: its whole surface is crisscrossed with dried-up beds of rivers and streams that later became part of the Baikal-Lena nature preserve. The nature preserve itself and the Buryat people who live here forbid passengers to be dropped here: according to their beliefs, access for outsiders to this shaman site should be strictly limited. Historians still do not know who built the 1090-foot-long stone wall on Ryty, nor do they know when it was built or why. The stone wall is adorned with stone cones and pyramids that point in the cardinal directions. The settlement of Onguryona (which is populated by Buryats) lies on Cape Ryty, right on the shore of Lake Baikal. The local population is well known for its technical acuity: the only steam locomotive in Russia that remains from the WWII stands here in the village. The steam locomotive has since been converted into a power station. When the northwestern “Sarma” wind blows, the air becomes so clear that it creates what is known as the “Baikal optical lens.” Under this lens, the horizon and tops of trees can be seen at distances of more than 93 miles and 31 miles away, respectively. Where: The northwestern shore of Lake Baikal. Travel by bus from Irkutsk to the “Zama” tourist camp, then go by foot to Onguryona village (hitch-hiking is possible, but there is no regular transport service). Travelers can also get to Cape Yelokhin via “Kometa” motor vessel (running on the Irkutsk–Nizhneangarsk route) and walk from there.